It’s that time of year again and the election is buzzing with charming new and old faces. You can keep track of all the latest polling results using the free Election Polling Tracker. This simple template makes it easy for your to keep track of each state’s polls so you can follow your favorite candidate and do everything in your power to get their message out there if they need help. The structure of the template only requires you to enter a few pieces of information at a time. Download the free template below to get started. Start by downloading the file; just click the link located at the bottom of this page. Once you have the document on your computer you can begin to edit it to suit this year’s election. The template comes with plenty of examples so you can just replace the information as you go. In the first column, enter the state postal ID of the state you’ll be following. Next, you will simply enter the name of the state in column B. Now, enter the FIPS identification number for that state so you can locate their official election information online as quickly and efficiently as possible. You will then enter the names of both candidates running for office after the primaries. The candidates are separated by green and blue slots and have their own percentages to the right. 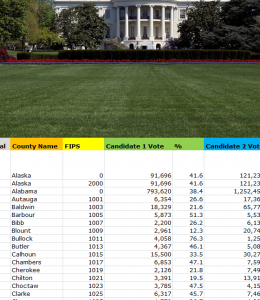 The “%” column will indicate the percentage of votes the candidate received from the corresponding state/county. Using this template you can easily keep track of your favorite candidates and watch as they progress towards the white house and make history as your new president.